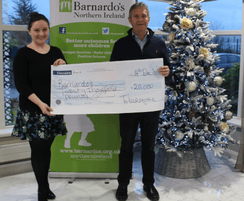 In the true spirit of the season of giving, Tobermore donated £20,000 to Barnardo’s in lieu of Christmas gifts. These much-needed funds will make a huge difference to the lives of vulnerable children across the UK and Ireland this Christmas. While Christmas is commercialised in the media as a time of celebration and indulgency, it’s important to remember that this time of year can be quite the opposite for families who are experiencing financial difficulties and children who do not have the support of a parent or guardian. Barnardo’s work tirelessly to help improve the lives of children found in these circumstances. Barnardo’s is one of the UK’s leading children’s charities, working directly with 240,000 children, young people and families every year while operating 960 vital services across the UK which includes counselling for children who have been abused or rehomed, vocational training and disability inclusion groups. 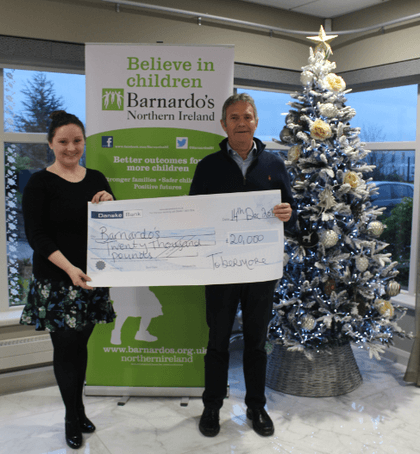 Tobermore has donated funds to Barnardo’s at Christmas for several years and the company’s donations currently total over £200,000. Aoibheann Doherty, Regional Relationship Manager at Barnardo’s Northern Ireland, is pictured being presented with the donation from Tobermore’s Managing Director, David Henderson. Visit the Barnardo’s website to find out how you can get involved in fundraising to help support this amazing cause.